Things started out pretty well. In my current work solutions, I have (4) projects that constitute the basic infrastructure for an Angular 1.x application. These include a web project, web content project (scripts, css, etc), utilities project, and data access layer. Using these projects has made it really handy to have a simple template for starting an Angular 1.x application. 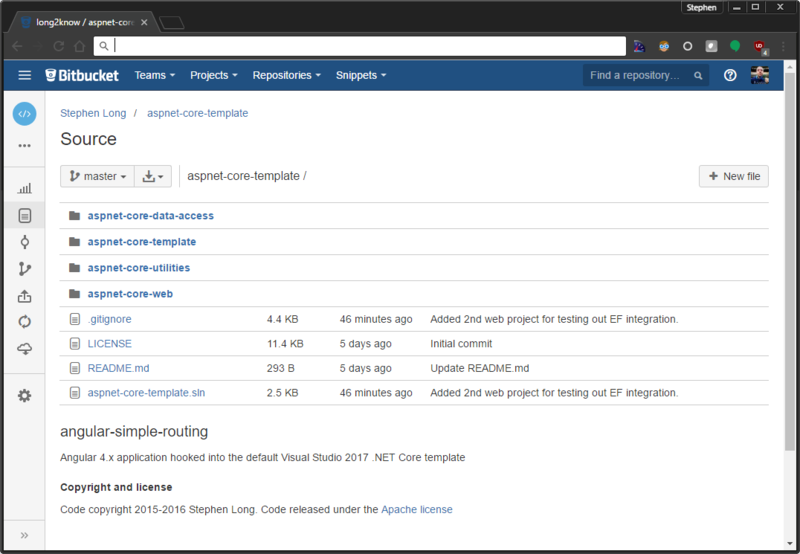 These projects are also rolled into Nuget packages to make updating things painless. To start my conversion, I focused on the utility project and data access layer. The data access layer depends on the utility project since the utility project has all sorts of helpers which include everything from generic Expression builders to string extensions. The first thing that I found that is different is Reflection. You can’t do things like “typeof(Obj).IsEnum.” Rather than using a Type object directly to get information about whether it IsPrimitive and such, you have to use a TypeInfo object. Caching has changed relatively dramatically. HttpRuntime.Cache is no more. Now, IMemoryCache, must be injected and used. The BinaryFormatter is gone from .NET Core, so my routines for DeepCloning had to be removed. I don’t have a quick and easy replacement for that yet. Previously, I blogged about the changes with HttpContext and using IHttpContextAccessor to get the context, so I won’t dwell on that much here. Those were the most memorable parts of converting my utility library. Porting the Data Access Layer was pretty involved. I’ve talked about this porting process a bit before. ConstraintException is no longer available. DbEntityValidationException, which I’ve mentioned before, is no longer available since DbContext no longer performs entity property validation. TransactionalBehavior is no longer available. DbContext.Database.SqlQuery<T> has been replaced with DbSet<T>.FromSql(..). I actually think this is a good improvement. the FromSql command is actually a fluent API that allows adding additional LINQ filters/expresisons to the query. This is pretty nice. Previously, EF was pretty ridged in how it handled mapping raw SQL to a list of objects. In fact, it would not even honor your metadata. Since raw queries, like executing a non-query or scalar, are no longer directly supported, we have to resort to ADO to accomplish this. Fortunately, it’s pretty straight forward. In my old EF 6.1.3 libraries, I had methods that used Reflection to retrieving fully materialized queries from any IQueryable. This was handy as it was used beyond logging/tracing. For one particular application, this was used to generate queries based on user selections. Those queries were saved to a database and used as part of a SQL Job that imported data. That is one scenario that comes to mind for being able to generate queries. EF Core 1.1.1 makes this no easier. I did stumble across an EF Core based routine, which again is using Reflection, to achieve the goal of producing materialized queries. There are other functions/methods that I have not figured out how to port yet. With EF 6.1.3, I had routines for using SqlBulkCopy, performing batch/bulk updates and deletes, and other handy functions. I’m not sure how to approach these yet. I also had routines that would use EdmFunctions to be able to automagically hook into scalar functions when queries are run. Here are some links to all of the various articles I read alone the way..